Andrew Chmura, Chris Campbell, Sam Duvall, Kyle Ross, Jimmy Watson and Guillaume Hospod (l tor) are some of the professionals in Stowe working to bring pro tennis matches back to town. Stowe plays host to some notable sports events, but most of them are on snow. Yet back in the early '70s, Stowe attracted some of tennis’s biggest stars. And today there’s a group of Stowe businesses working to revive the town’s status as a professional tennis magnet. "There used to be a tournament in the early '70s called the Head Classic," explains Stowe businessman Andrew Chmura. "And, I mean, Jimmy Connors, Illie Nastase, some of the best players – historic players – throughout the world came to Stowe and played tennis here." Chmura runs a pair of tennis touring companies, Grand Slam Tennis Tours and Topnotch Tennis Tours, both of which are based in Stowe. He’s just come back to town from a trip to the French Open. Earlier this year, Chmura partnered with sports agent Sam Duvall to start Topnotch Management, also headquartered in Stowe. The agency manages some big names in tennis, including top-ranked American John Isner and Shelby Rogers, who was the big Cinderella story coming out of the recent French Open. Duvall says there’s a lot of love for Stowe in the professional tennis community. "You talk about Stowe, Vermont to people who are now coaches and who have played here, and it’s like some of their most fond memories as professional tennis players," he says. Chmura and Duvall are committed to bringing that level of play back to Vermont. 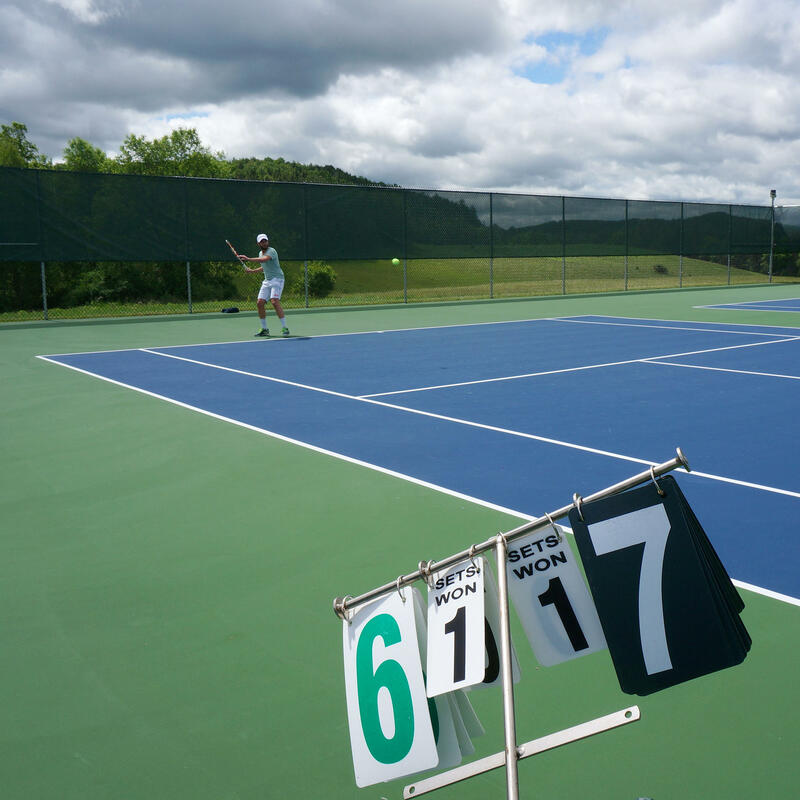 Currently, they’re working to land a Davis Cup event in Stowe. 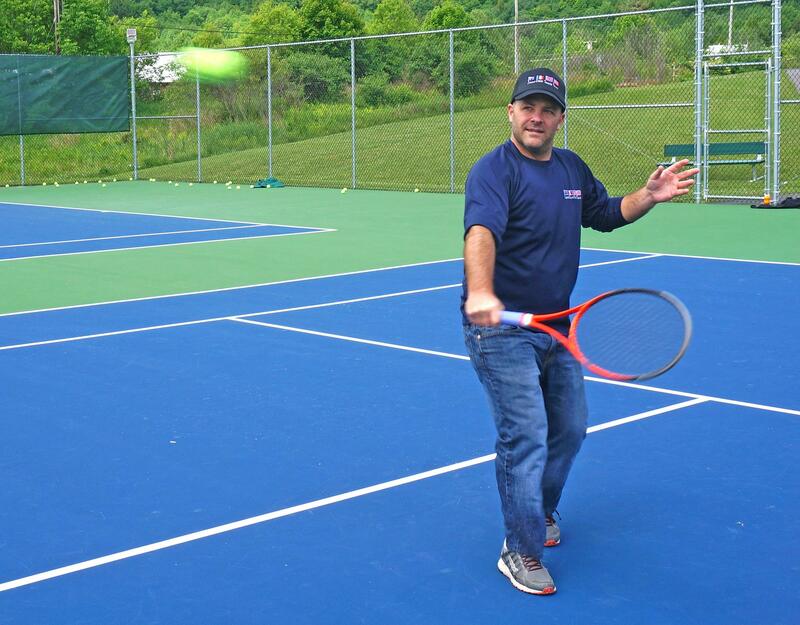 Andrew Chmura takes a little time away from the office to knock a ball around the courts at Stowe High School, not far from his business headquarters. The last international tennis tournament in Stowe was the 2007 Fed Cup quarterfinals. Chmura is the person responsible for bringing it here. For those not familiar with the world of professional tennis, Chmura explains the Fed and Davis Cup match-ups: "They’re kind of like World Cup events, but in tennis ... Fed Cup is the women and Davis Cup is the men." In 2007, Chmura won a bid to bring the Fed Cup to the very location where the Head Classic was held back in the '70s. "And we had Venus Williams come up and Nadia Petrova and Elena Vesnina, who’s now a Topnotch Management client," he recalls. "So we had a pretty big, established group of athletes who were coming up and two big countries battling against each other. It was kind of cool, Russia versus the United States in Stowe, Vermont." 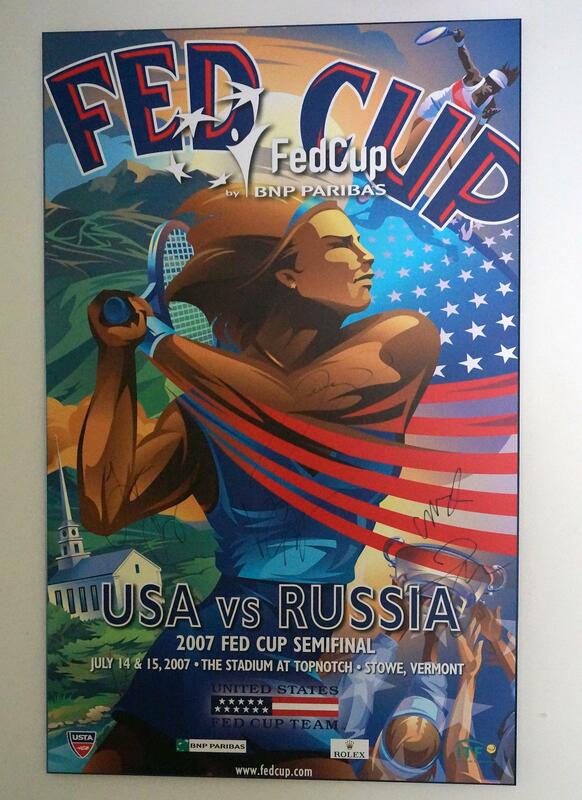 A 2007 Fed Cup poster, signed by the players, hangs on the office wall. And now Chmura says he’s ready to do it again. "The event went fantastic," he says, "and since then we’ve been trying to figure out how to do something a little bit bigger and even more fun." Chmura and Duvall said they came really close to landing this July’s Davis Cup quarterfinals in Stowe, but didn’t get the bid. So now they’re rooting for the U.S. to make it into the semifinals so they can vie to host it in Vermont. "We thought we had it and it ended up going to Oregon," says Chmura. "But we learned a lot more about the process. We understand how to do it, kind of moving forward. And if we win we’re going to have another shot at one in September." But Chmura and Duvall haven’t put all their eggs in the Davis Cup basket. Duvall says they’re also pushing for an annual event in town: a women’s tournament that would be part of the lead-up to the U.S. Open. "The WTA Tour is what it’s called," Duvall explains. "We’ve been in talks to try and bring an event here the week before the U.S. Open ... It would be an annual event on the calendar and we think it would be really successful here." Duvall says an international tournament would shine a spotlight on Stowe and on Vermont. "One cool thing is that if we do get the Davis Cup up here, or another event in Stowe," says Duvall, "we’re able to literally write Stowe, Vermont on the court, which is televised in over 100 countries, which would be really, really cool for the community and for the state." And Chmura adds Stowe is a big tennis town that deserves a big tennis event. The tennis courts at Stowe High School are among hundreds of public and private courts in town. "There’s 400 tennis courts in Stowe," he says. "That’s like one for every 10 people. There’s plenty of tennis courts. So, I mean, there’s a lot of people that play tennis ... We deserve some awesome tennis here in Stowe." If the U.S. men advance from the quarterfinals and the local Davis Cup bid is successful, tennis fans can look forward to some awesome tennis in Stowe this September. Every Tuesday, a group that calls itself the Trash Tramps takes to the streets of Montpelier to pick up litter. They start their quest with a rallying cry, borrowed from Unitarian Minister Edward Everett Hale. The building adjacent to Ludlow's Community Center will henceforth be know as The William and Phyllis Agan Memorial Building. The new name has already be installed on the building and the town has scheduled a public dedication ceremony at 10 a.m. on Tuesday, June 14. Weston Playhouse Theatre Company, courtesy. Two Weston institutions are celebrating big anniversaries this month and the community plans to throw them a birthday party on Saturday, June 18. The Weston Playhouse Theatre Company is commemorating its 80th year and the Vermont Country Store is turning 70. This spring a new section of the Lamoille Valley Rail Trail is open for year-round use. But the operator of the trail is short of funds, and needs to raise money privately to complete the project.